A couple of months back I tried – Hair for Sure tonic from Athena Life Sciences for my hair loss problem and –came away totally impressed. I decided to keep an eye on the brand. I often get dandruff from time to time, particularly when the seasons change. And to treat it I often reach for an anti-dandruff shampoo – sometimes Dove, sometimes Heads & Shoulders depending on the condition of my hair and scalp. But while these shampoos are effective in treating dandruff, they leave me with super dry hair. Learning D’Free Anti-Dandruff Lotion too is a product from Athena Life Sciences, I immediately bought it to treat my dandruff problem during this winter. Now whether, this anti-dandruff overnight lotion turned out to be a hit or a miss, read review to discover. Like with other anti-dandruff products and shampoos in the market, the active ingredient in D’Free anti-dandruff lotion is Zinc Pyrithione, an antifungal/ antibacterial agent commonly used to treat scalp scaling, itching and flaking. But while, most over the counter anti-dandruff products use just one main active ingredient, D’Free contains three powerful anti-dandruff ingredients that work to give you itch-free scalp and dandruff-free hair in as less as two weeks. Also since D’Free stays on your scalp for one full night, the active ingredients in this anti-dandruff lotion get better time to work on your scalp than most other anti-dandruff products and shampoos that just stay on your hair for a few seconds to minutes. 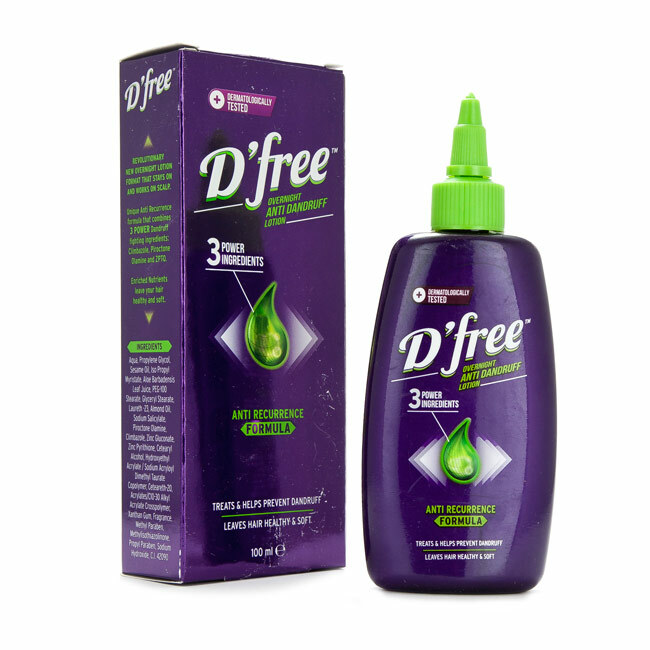 D’Free anti-dandruff lotion comes in a small purple carton with green twist open nozzle cap. The twist open nozzle makes it quite easy and convenient to use the product giving you full control on the quantity to be dispensed. To apply, I generally part my hair in sections and then put the product directly on the scalp using the nozzle. The lotion is white in color and has thin runny consistency. I like the thin texture of this lotion as it gets absorbed easily and once worked into the scalp, it doesn’t feel heavy on the hair like most anti-dandruff hair oils, creams, and serums do. And as for the scent, it is quite similar to Hair for Sure lotion, refreshing but strong and overpowering. I’m a regular user of anti-dandruff products, both anti-dandruff shampoos and anti-dandruff hair oils, but this is the first anti-dandruff lotion I have used that’s billed as an overnight treatment. To use the lotion, apply the lotion all over the scalp and gently massage it in with your fingers at night before going to bed. Leave on over-night and then wash off next morning with a gentle shampoo or cleanser. The brand says to use the lotion twice a week for at least two weeks for effective results. In the mornings, after washing hair with my favorite moisturizing shampoo, my scalp feels squeaky clean and my hair look softer, smoother and more alive than day before. Generally, the itch and flakes return just on the second day of shampooing. But after using D’Free anti-dandruff overnight lotion my scalp remained itch and flak-free even after fourth and fifth day of washing my hair. Using D’Free anti-dandruff lotion for more than two weeks has indeed greatly improved the condition of my scalp. And the best part – it doesn’t make my hair dry like most other ant-dandruff shampoos, particularly Heads & Shoulders. If you too get dandruff from time to time, consider using D’Free anti-dandruff lotion. Being an overnight anti-dandruff treatment that contains more than one active anti-dandruff ingredient it works better than most anti-dandruff shampoos to give you itch-free scalp and dandruff free hair. And given the fact, it is dirt cheap and doesn’t dry out the hair, makes it one of best anti-dandruff product in the market today. I hope you’ll like it too. Hello Anshulika… I love this post of yours. There are so many good anti-dandruff and other products in local and online market. Where you can use according to your needs. My hair fall problem was more. Last six months i has been using product of Annimateo and the result is unbelievable. I try to use your product.